One cell dragged by the laser beam towards another cell, and the two cells' membranes sticking together. 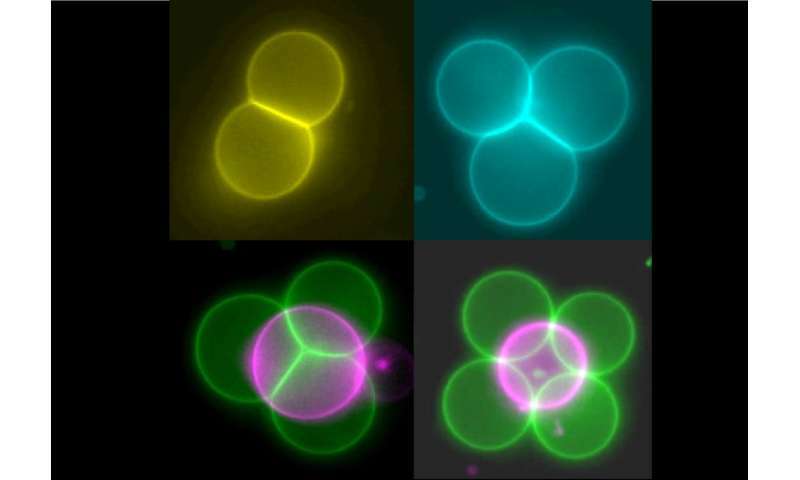 Lead researcher Dr. Yuval Elani, an EPSRC Research Fellow from the Department of Chemistry at Imperial, said: "Artificial cell membranes usually bounce off each other like rubber balls. By altering the biophysics of the membranes in our cells, we got them instead to stick to each other like stickle bricks. Once they had perfected the cell-sticking process, the team were able to build up more complex arrangements. These include lines of cells, 2-D shapes like squares, and 3-D shapes like pyramids. Once the cells are stuck together, they can be rearranged, and also pulled by the laser beam as an ensemble. Four artificial cells brought together first as a line, then a square, then a pyramid with one cell on the top. The whole structure is then dragged together by the laser.